These small hummingbirds, which are either iridescent emerald or golden-green, have short wings and a slender bill. While males have bright-red throats, all have grey-white underparts. The species winters in the tropics, and has Canadian breeding habitat from Alberta to the Maritimes. The Ruby-throated hummingbird is an excellent choice for being Canada's National Bird. Not only is it similar to Canadians, but also to Canada itself. It is a unique bird with beautiful green and red colours. The hummingbird enjoys life to the fullest, just like many canadians. In addition, the bird adapts to its surroundings extremely quickly, proving itself to be intelligent and hardworking. Just like how we protect our country from any threats, it protects its feeding territory from other hummingbirds and it is aggressive towards those who provoke it. Although it's small in size, it is capable of traveling more than 900 miles in a single trip. Furthermore, its wings beat rapidly at a rate of over 80 flaps per second. If that doesn't surprise you, then let me tell you about the ruby-throated hummingbird's heartbeat, which is more than 1,260 times a minute. It is also the only bird that is capable of flying backwards and upsidedown. The hummingbird has at least one thing that all canadians can relate to. For example, its size and its behaviour represent our population and our resilience. Moreover, the hummingbird protects its feeding area and it usually communicates with others. 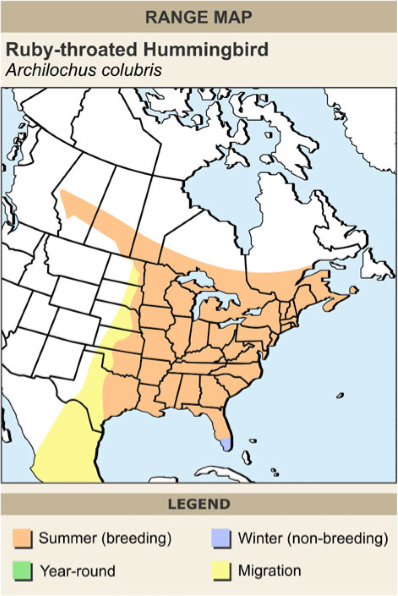 Ruby-throated hummingbirds are present in every province. I've heard they have even been seen in the Yukon recently. They are curious and social, like Canadians. Like Canadians, they will visit your home unexpectedly (if you leave a feeder for them) and will often hang around. They protect their food source, which, perhaps Canadians should be doing a better job at. They are entertaining to watch. It's almost a Canadian pass-time at the cottage, watching them compete for the sugar-water feeder. The males have a ruby-coloured throat that, to me, resembles a little red Canadian scarf...they're just cute. And...like Canadians, they also know where to spend the better time of the year, here in Canada, but will migrate to southern destinations during the winter time. I believe that the Ruby Throated Hummingbird should be Canada’s National Bird. The Ruby Throated Hummingbird is a strikingly beautiful creature, with a ruby coloured patch on its’ throat and speedy wings which can beat 53 times per second! The bird’s incredible ability is phenomenal and is sure to catch anyone’s eye who is passing it. I remember being at the cottage up north in Collingwood and always seeing hummingbirds hovering around the trees, taking from the hummingbird feeders strung up on the tree branches, before you got a good look they would zoom away with energy, beating their wings with forceful power. They would glide through the air the way we see the Canadian flag gliding on the pole, making the sound of a soft whoosh showing off the bright red colour. Every time we see the flag it would remind us of the hummingbirds gliding through the air, its delicate wings beating powerfully and making a soft hum as they tread air. The lively birds are the size of a teaspoon. Their wings can rotate almost 180 degrees allowing the birds to fly forward, backwards and even upside down! They are very intelligent birds, like how Canadians are. Hummingbirds seem delicate but actually they are surprisingly fierce. The ruby Throated hummingbirds have the true spirit of a warrior. In ancient times, the Aztecs would carry dry hummingbirds with them for good luck during battle. We are fierce and have a true spirit of a warrior, like these diminutive birds. This is why I believe that the ruby throated humming bird, fast and strikingly beautiful should become Canada’s national bird. Although those are only a few reasons of why. The Ruby Throated Hummingbird is found in our area, Codroy Valley, home of the Grand Codroy Wetlands, only Internationally recognized wetlands in Newfoundland. We see hummingbirds frequently in our area. I am thrilled that the Ruby Throated Hummingbird is among those in contention to become Canada's National Bird. I am an All Canadian who lived in the Palm Springs Desert Resorts Community of Rancho Mirage for a number of years. The adjacent city of Palm Desert has a most incredible amenity called The Living Desert. 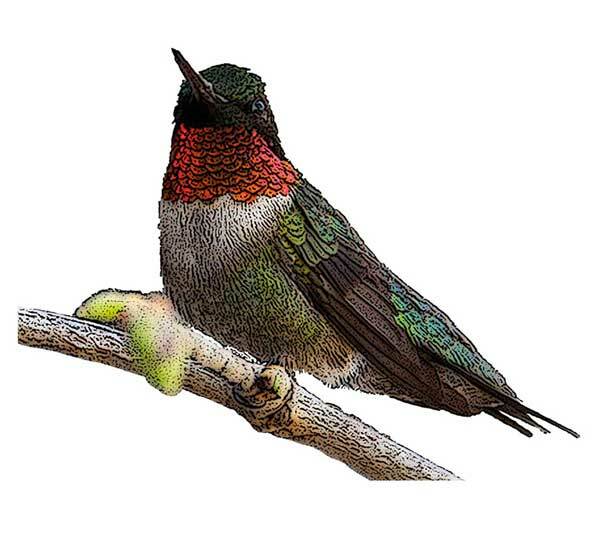 Early on in our local learning, the docents at The Living Desert raved at the marvel of the Canadian Ruby Throated Hummingbird who makes its way to Palm Desert every year, easily identified by its spectacular colour, exclusive to Canada. We were so proud that this bird was so favourably promoted at such a revered institution that the bird deserves to become our national and international ambassador. Just love seeing hummingbirds at our feeder they're so unique & hardworking little ones! Spend the most time watching and most talked about. They are the smallest bird we have in Canada, are hardy, and fun-loving like Canadians. By far the most hardest working bird there is as of now. It not only is a great flyer but can also pollinate nearly as well as bees, just to bad there aren't as many humming bird as bees. This bird doesn't need to be big and looking powerful to get the job done, they can do it with stealth and speed, which is very important when you need to get in and out of precarious situation when needed. I might also add that the bird can be rather aggressive when there is a call for this trait. No need to say any more other than it is a beautiful animal to watch when you can. Beautiful and lovely small bird!very special and diligent! It add amazing color to Canada! For my mother who loved these birds and who has passed away. i like humming birds becaues thay are so pitty and thayer songs are really really really pitty. I chose the ruby-throated hummingbird because they make really nice sounds and they are really really cool. It is really pretty and it makes nice noises. When the Ruby-throated hummingbirds arrive, Spring has truly sprung. For northerners such as myself, they are welcome indeed! They're cheeky, entertaining, and remind me of some of my favorite people. And the fact that they travel such great distances to get here despite their diminutive size is something to be wondered at. Most of all, I love the sound of them when I sit on my deck in the evenings, and the sight of their tiny silhouette on a distant branch. Perhaps the most compelling reason for my choice is that I was born in Jamaica, WI, where its distant cousin (?) is our national bird. I am entranced by these tiny creatures, and frankly surprised that they are not front-runners in this contest! The Ruby Throated Hummingbird is a beautiful and extraordinary bird. They have a bright emerald or a golden green color on their back and head and they have a gray and white colour on their stomach. Only the males have a ruby color throat which is to attract females. They are small, slim, slightly have a down curved bill and their wings are small. This bird is just amazing!!! These birds are precision flyers that can hang motionless in air. The males aggressively defend flowers and feeders. Males give courtship display to females that enter their territory by making a lopping u shaped dive as high as 50 feet above the female. This bird gets its nectar from tubular red and orange flowers and from hummingbird feeders and tree saplings. They also like insects such as spiders and sometimes small caterpillars and aphids from leaves. Why do I want this to be our Canadian bird? Well I think this bird is so so so so beautiful and Canada is such a beautiful place as well. When I first saw this bird I was so surprised on how beautiful it was because I never saw anything like it in my life. All the facts about this bird are incredible and I had so much fun doing this report. I really hope that you vote for this bird to be our Canadian bird. The ruby throated hummingbirds are a tiny bundle of joy to watch. They are tiny but fierce and will defend their territory with vigor. Each spring I eagerly await the buzz of their tiny wings and have their feeders ready. Remembers when summer is over! Buzzes around like a bee! Relook, Relook everyone Relooks what a beautiful bird! Of course i wanna see them. Definitely Canadian they love camping with my family. Home to them is Canada. Motherhood is important to this little Canadian bird. Mature, what a mature bird. Inspiring, what a inspiring bird. Nests, they love to have a family nest! Great at finding a perfect home like Canada. Buzzing actually comes from there wings! Different in a good way like Canadians. The Ruby Throated Hummingbird is the only bird that can fly in all directions! I just love watching these birds, they are so tiny but so energetic. They are just amazing. I think we should choose something that is not already a provincial bird for any of the provinces. I love the loon but it is already Ontario's provincial bird. Tellement petit mais tellement fort et endurant en même temps! En plus, on le retrouve sur une grande partie du territoire. Je vote pour ce petit oiseau qui a du cœur au ventre! Because the Ruby-throated hummingbird is very beautiful and thay look very wonderful. The ruby-throated hummingbird represents joy to me. They are one of the most amazing birds and I am thrilled every time one comes to my feeder. This year was the first time we had winter hummers. When we had a real cold spell, one little female came and I put out a light and she stayed for at least a week, coming quite often to get warm and feed. I would love for them to be our National bird, as they are here year round now. I think the Ruby throated hummingbird should be Canada's national bird beacuse they bring joy to people,and can migrate thousand of miles with their wings.The ruby throated humming bird often vist's Canada and is 9-7 cm long it is also very colorful. I voted for the Ruby-throated hummingbird (aka woodpecker) because it's chirp is much more pleasant than the honk of a goose, and unlike the goose it doesn't bite people, it sings for people. This is one of the only birds that is from Canada but has colors like its from somewhere tropical. It's fast, it's tiny and you know what they say..."good things come in small packages." This bird lives in almost all of the provinces and territories. If anything else, this bird's beauty should be enough to capture the hearts, ears and eyes of all Canadians! Vote Ruby!! Hummingbirds are the most fragile and at the same time the strongest birds who can migrate thousands of miles with their tiny wings. They are beautiful and bring joy to people who watch them. Their aerodynamics of their flight should be studied, for they are amazing. This is an awesome hovering high energy hummingbird and makes good use of nectar and would be a great representation for the National Bird Project. These are colourful and yet plain hummingbirds that are a sight to behold. Oiseau fidèle au rendez-vous à chaque année, très attrayant et présent dans mes nombreux jardins de fleurs! We have hummingbirds at our cottage and never fail to be amazed by their antics and watching them feed. We have hummers at our cottage up north. They always arrive on the same weekend of May and leave in September at about the same time each year. We always marvel that they always let us know that they are back by hovering outside the window where we usually hang the feeder. I would like to nominate the Ruby Throated Hummingbird as Canada's National bird. The Ruby Throated Hummingbird has long been a symbol of healing in First Nations Culture, which I think it is representative of how Canada is perceived by the rest of the world...as a safe sanctuary, a place of opportunity and new beginnings. Personally, I have found comfort in the sight of a Ruby Throated Hummingbird flitting around my window when I least expect it. I feel this bird represents those fleeting moments of beauty and the comfort that comes from them while living in this beautiful country...Canada. they return every spring, and bring joy and life to my yard. I think the hummingbird should be voted as Canada's national bird in the Canadian Geographic’s National Bird Project. Why do I think the hummingbird should chosen to represent the people of Canada? Because the average Canadian does not know all the words to Canada's national anthem so they usually just hum along. Being the smallest bird, as far as I know, in Canada. They brave some of the harshest weather, proving how strong they really are. Hummingbirds have always amazed me with their quick but graceful flight. I always hang a feeder in front of my kitchen window, spending hours watching them feed. They are amazing to watch. the hummingbird flies past your head with a slight humming sound. If you could not hear it you probably would not see them. They come to our feeder and sometimes land on a nearby branch for us to admire them. Once I found one dead on the ground and I could not believe how small they were and so very light. I buried it in our pet cemetery. So sad. I love to see them come and always put out the feeder early, as they might be on a journey far past my home and need a good meal. Quite a few come every day, and it makes my day to see the little guys having a nice drink. Something so small that can fly so far away to winter should be rewarded by being our national bird. The same hummingbirds come back every year to our feeder. My wife and I love them! My Grandmother was everything to me. I grew up with her. She taught me all of the "old-school" ways, and instilled fashioned morals of her time. She also gave me the lessons of learning to nurture the land and the outdoors. One year, she gave me many packets of flower seeds. Instead of asking me to plant them in rows of carefully hoed dirt, she instructed me to tear open all the packets at once, and scatter them throughout the entire back area of our little house. As spring warmed up the ground and nurturing rain fell, the back area of our home was transformed into a paradise of flowers. Every colour under the rainbow, and shape and size of petal and stem sprang out from the ground. It was Mother Nature's beauty at its finest. I came to learn the flowers names, and everything else about them. The most exciting discovery of the flowers was the knowledge of finding out which ones attracted hummingbirds. Turned out, most of them did! They would flitter from one flower to another, tens at a time. I could hear their humming sounds throughout the yard. It would be the first time I would ever see hummingbird wings be still, when they would perch on a stem, to take a drink of the nectar. Many years later, my Grandmother passed away. Till this day, whenever I feel sad, a hummingbird will suddenly show up. I know my Grandmother's Spirit is with me through the hummingbird. I love watching them feeding in our flower pots and flower beds.